Topic: This project is about making photos of a sunset with a Nikon D200. Starting with full daylight photos will be taken until astronomical sunset (sun is at -18 degrees below horizon). This requires constant adaptation of the cameras settings (ISO / aperture and time) due to the diminishing light. I will record the luminosity with the Arduino, so I can set the average brightness of the single images afterwards accordingly. I will try which one is the best, measure some sunsets and gauge the camera against it. In order to better understand what I am doing, I am developing some small tool, which tells me some astronomical data – as the position of the sun by time and date and some star positions. Topic: How to scan color transparencies. 1. The scanner has some bad pixels, so I get stripes in the scanned image (solved by downloading and installing the newest version and clicking on “calibrate”). 2. How to get rid of newton rings? I started with a dry scan and asked myself what side should be up: The base or the emulsion? The first thing I noted was that the film bends. According to my observation it bends the edges upwards, when the emulsion side is up. Since I don’t have a film holder, I put the emulsion side down. This enables me to fix the film with tesa film on the scanner, where the tesa touches only the base side. This apparently solved already the Newton ring problem – at least for some photos. There were still some showing up newton rings. My overall impression comparing the dry scan with the wet scan was, that there is only a very slight improvement of the sharpness in the wet scan. If the water is applied to the upper side (base), it had some effect on the color of the image: the scan comes out darker in comparison with the dry scan. After washing the image, it dried normally having no visible effect on the color nor leaving some marks behind. Topic: This post is about the application of the MF522-AN RFID reader and the Arduino for cards-magic (current stage: Proof-of-concept). Effect: A randomly picked spectator shuffles a deck of cards, picks out a card of his choice and puts it into an envelope, which he places on a table. The magician is able to tell which card he has chosen, just by concentration – never having touched the card not the deck. Getting the MF522-AN RFID reader working was pretty straightforward based on a script by Dr.Leong (http://www.b2cqshop.com/), which was sent to me after I purchased the hardware at ebay. I then placed the RFID chip between two cards, glued them together (see photo 2). The RFID reader was able to read out the chip through my working desk: I placed the Arduino with the RFID under the desk and placed the envelope above it (on the desk). I modified the script by Dr. Leong such that it would print the cards name (in case the RFID tag was known, otherwise it would use the standard output of Dr. Leong (as the Chinese characters will not show up here, I deleted the comments). // We can do more here, set the date, the headers, etc. Topic: In order to display the measured voltage values graphically, the data need to be transferred to the computer. 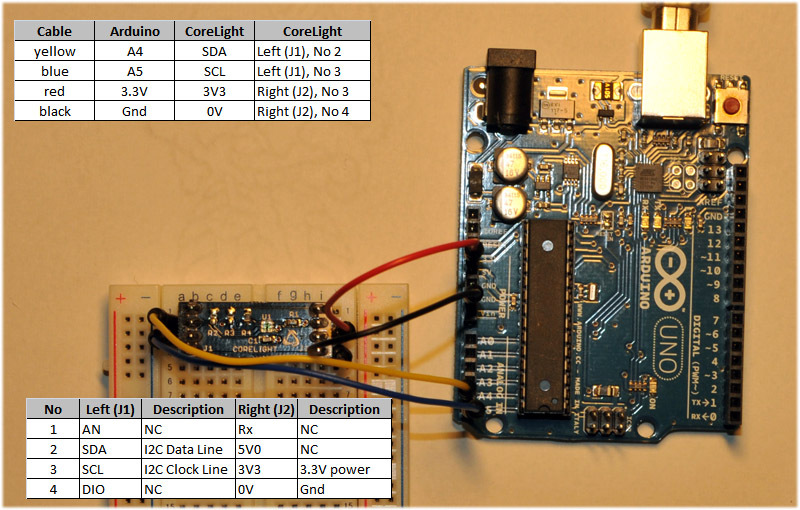 the Arduino sketch has to be reduced to a minimum. All the evaluations are done on the main computer. The Processing sketch on the main computer. This is a modified sketch of a sketch written by Maik Schmidt. I use a the combination “Thunderbird” as a mail program, with “Enigmail” (encryption addon) and “gpg4win” for encryption. Topic: How to install a browser that allows practically anonymous browsing in the web. Search for “TOR Browser” and read the manual. (The computer magazine “chip” has a free TOR browser package). Topic: This post is about measuring the reaction time of a (digital) camera. More precisely: The time difference between the trigger by cable release and the moment when the photo is taken. What is this for? Precise timing for the water drop photography. Implementation of the time delay using different camera settings (without flash, with manual flash, with TTL-flash) in the code for taking the photo after the water drop passes through a light barrier. with s: distance from the height from which the object is dropped to a) the light barrier and b) the position on the photo. The difference in the times for a) and b) is the reaction time of the camera. The D200 with flash is significantly slower and cannot be used for my setup. 650nm Laser Diode Module: 5.99EUR at ebay. I bought mine at ether.deal. This diode uses 5V input. (I used an Arduino board to provide the voltage, since I had two of them). 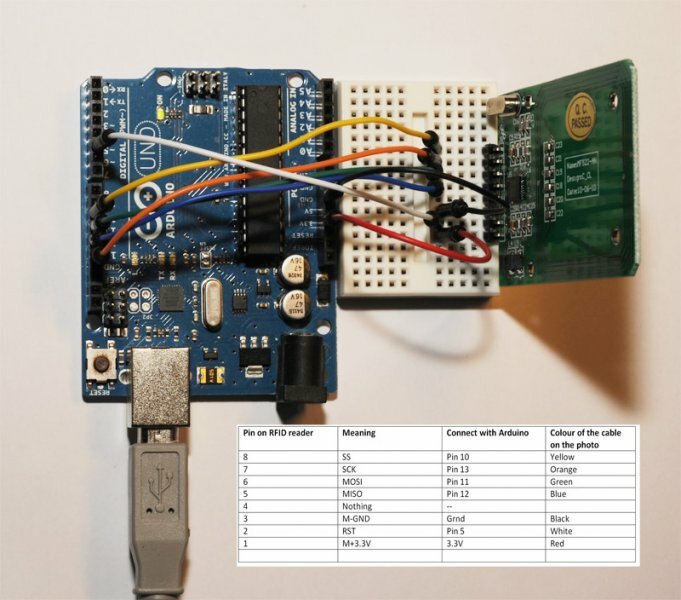 Arduino UNO (just because I was lazy. You can easily build up your own 5V power supply for the diode). several filters (colored plastic) in order to decrease the light intensity by the laser diode. Light sensitive resistor (I used VT 83 N2 (THT) from Watterott). It had a resistance of 1.5kOhm in darkness and about 0 Ohm when the laser diode was directed at it. A 1.5kOhm resistance (as the light sensitive resistor in darkness). An optocoupling device (PC817). I had one in an Arduino Starterset. lightning stands, clamps etc. to hold the laser diode, the photo resistor, a multivitamin tube and the filters to decrease the light intensity of the laser diode. 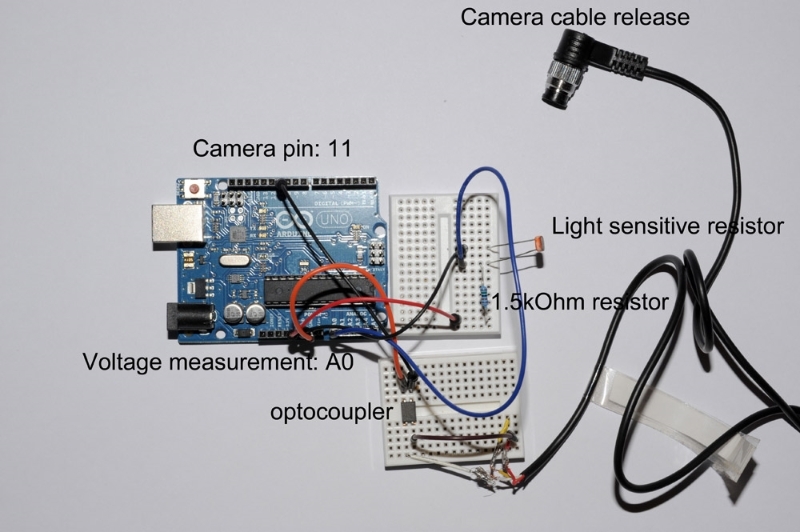 Arduino program to measure the voltage over a photo sensitive resistor and trigger a digital camera. Intention: Target is to measure the reaction time of the camera (i.e. time difference between trigger signal and moment, when the photo is taken). => use another 1.5kOhm resistance in serial. the voltage over the photo sensitive resistance is about 2V. // any input from the computer to steer the behaviour? int led = 5; // The 650nm Laser Diode Laserdiode Module is connected to Pin 5. 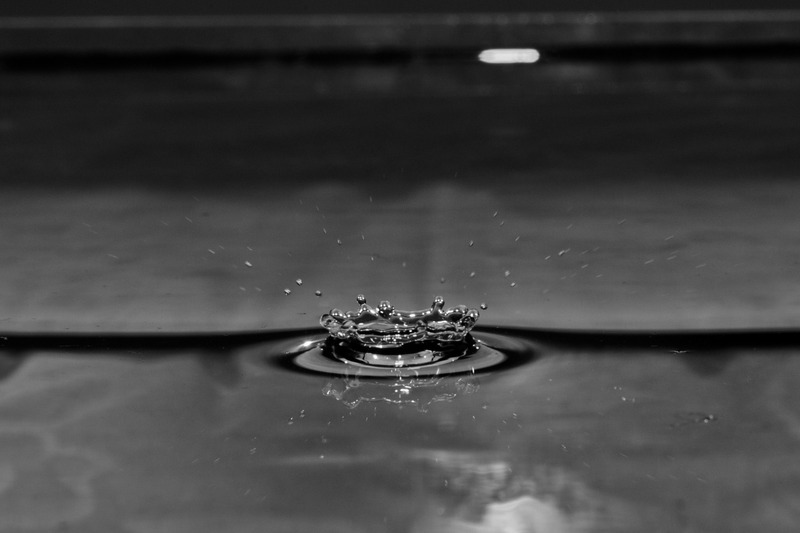 I was fascinated about the photos of water drops falling into a water surface and creating these crown like structures I saw in the commercials and thought: I want to be able to do these kind of photos. My first attempt was to program my camera to take a photo every 5 seconds, while I was dropping water into a glass bowl – manually by pressing a wet towel. I just hoped that I was lucky one time that the camera released in the very millisecond the crown was there, when the drop hit the surface. In fact I was able to catch a couple of these crowns (see photos _DSC0322 (2) and the following ones), but the number of photos going to the waste was incredible. I had to change the method. Searching the web I found light barriers made for my camera for several hundreds of euros. I thought I could do this cheaper myself. Well… Until I came up with the solution I shown below I tried a couple of different approaches. All of them ended in just spending money for equipment, books and a slight increase in my learning curve. In the end – it would have been cheaper to buy the ready made light barriers. But: It would definitely not have been so much fun! The basic idea is to measure the water drop by a light barrier. 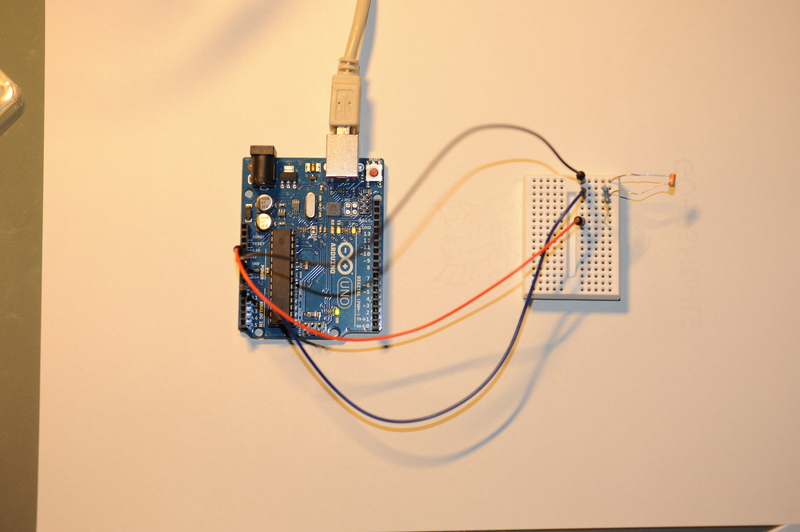 The light is emitted by a laser diode and measured by the voltage over a light sensitive resistance by the Arduino. After a certain time delay it triggers the camera. The following is a short description of the required material, the Arduino code(s) and some hints from my experience. laboratory stands, clamps etc. to hold the laser diode, the photo resistor, the cone for the water and the filters to decrease the light intensity of the laser diode. This is kind of important. My first trial (see picture DSC_0002 was very unstable and needed lots of time for regauging of the system). Try to set up the system as stable as possible. When somebody was moving in my living room, the laser diode was constantly swinging and defocused (and therewith triggered the camera). This led to some extra self-gauging loops in the Arduino code below. Set the camera to manual mode and switch off TTL measurement in your camera. This just increases the required time until the camera releases. Think about switching on the mirror pre-release. This increases the reaction speed and avoids vibrations of the camera. Create drops by dropping with a shot at the same point in the cone, do not drop too quickly. This increases the reproducibility of the result. over the photo sensitive resistance is about 2V.